I've never used a cycling distro(used manjaro for half ayear previously) long enough to witness a new release. How would I go about installing 19.04 when it drops. Would I need to clean install or will there be an upgrade button like in Windows? We're still working on improving the upgrade process over what Canonical provides with Ubuntu. Canonical provides either a command (do-release-upgrade), or a dialog window requesting to perform do-release-upgrade when it notices that a new release is available. And then will later have integration in GNOME Control Center to provide buttons for upgrades. Just upgraded my 18.10 installation. All good 19.04 seems to be running fine on my old i3 NUC. Upgrade was smooth and had no issues at all. I like the new icons and somehow everything just looks nicer. The updated Gnome I suppose. 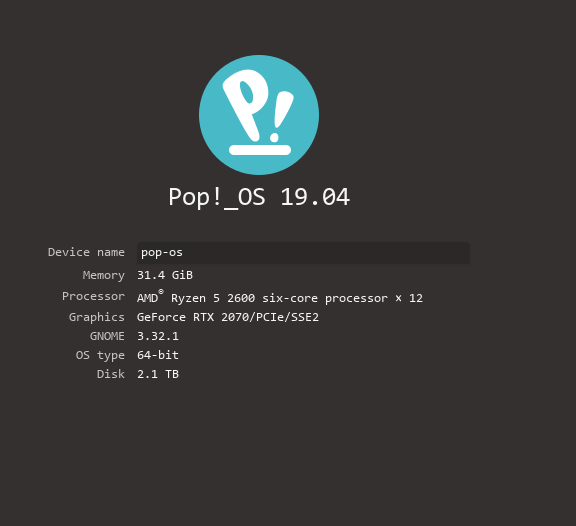 Anyway, good job System 76 Pop Os is the distro I always come back to! Yup, everything is fine here as well, minus this, for some reason. Neofetch is showing it as just Ubuntu 19.04. Yet this is showing correct. Yeah, I saw some stuff posted about it a little while after I posted that. Thanks for the link.